The Grand Fleet was the main fleet of the Royal Navy during the First World War. The 2nd Battle Squadron of the Grand Fleet in 1914. From left to right the ships are: King George V, Thunderer, Monarch and Conqueror. Formed in August 1914 from the First Fleet and elements of the Second Fleet of the Home Fleets, the Grand Fleet included 25–35 state-of-the-art capital ships. It was initially commanded by Admiral Sir John Jellicoe. He was succeeded by Admiral Sir David Beatty in December 1916. 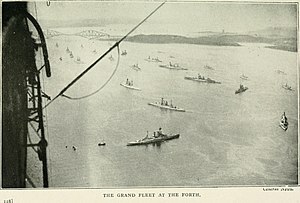 The Grand Fleet was based first at Scapa Flow in the Orkney Islands and later at Rosyth on the Firth of Forth. It took part in the biggest fleet action of the war – the Battle of Jutland – in June 1916. In April 1919 the Grand Fleet was disbanded, with much of its strength forming a new Atlantic Fleet. Not all the Grand Fleet was available to put to sea at any one time, because ships required maintenance and repairs. At the time of the battle of Jutland in May 1916, it had 32 dreadnought and super-dreadnought battleships. Of these 28 were in the Order of battle at Jutland. The order of battle of the Grand Fleet at the end of the war appears in the Naval order of 24 October 1918. The actual strength of the fleet varied through the war as new ships were built and others were sunk, but the number of battleships steadily increased as the war progressed and the margin of superiority over the German fleet progressed with it. After the United States entered the war, United States Battleship Division Nine was attached to the Grand Fleet as the Sixth Battle Squadron, adding four, and later five, dreadnought battleships. ^ "The Pink List: Position and Movement of H.M. Ships, 11th November 1918 8 a.m." The Admiralty. Retrieved 13 February 2015 – via naval-history.net. Heathcote, T. A. (2002). British Admirals of the Fleet 1734–1995: A Biographical Dictionary. Barnsley, South Yorkshire: Leo Cooper. ISBN 0-85052-835-6. Jones, Jerry (1998). U.S. Battleship Operations in World War I. Naval Institute Press. ISBN 978-1557504111.